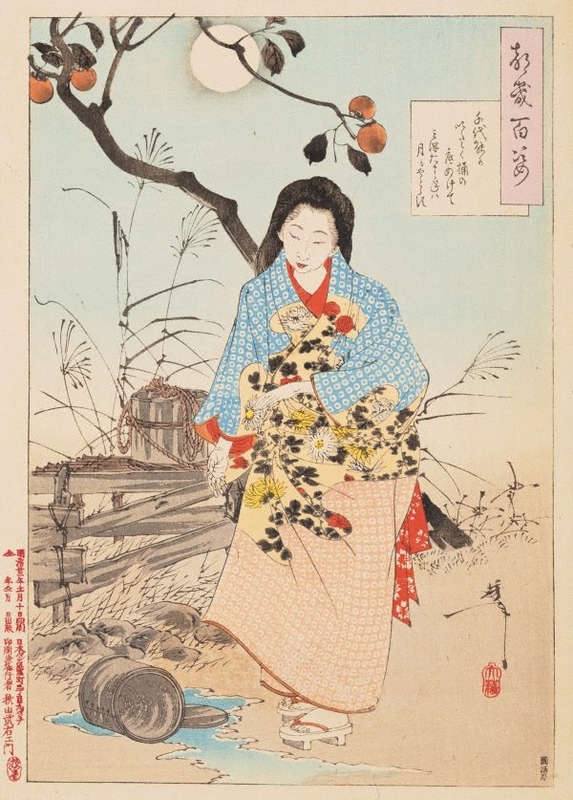 There has been much confusion about this work, which has been mistakenly said to depict Kaga no Chiyo (1703–75), a famous 'haiku' poetess who lived in the Edo period. It is most likely the poetess Adachi Chiyono, a daughter of a Kamakura period warrior Adachi Yasumori (1231–85). After the fall of her husband’s political position, she decided to become a Buddhist nun, under Mugaku Sōgen (1226–86), a Chinese Zen Rinzai master. She was given the Buddhist name Muchaku. She is sometimes also confused with another female Zen master, Mugai Nyodai. Her poem refers to her laboured efforts to attain enlightenment. Natalie Seiz pgs. 7-8, TAASA Review , 'Stories of women in Yoshitoshi's One Hundred Aspects of the Moon', Sydney, Sep 2016, 7 (colour illus. ).